Here's how I ultimately resolved it. The Deploy Automatically section of the Option Editor explicitly states that its intended use is for clients who lack administrative privileges on their PC. However, there will be a launch failure in that scenario regardless of the elevated permissions entered. This functionality was developed in the Windows XP days and hasn’t really worked reliably since Windows 7 was introduced. The startswinstall.exe actually runs under the local client SYSTEM account, which will need full control permissions for that application. The client should also be logged in with a Windows account that has administrative privileges for the image to run successfully. You can verify the success or failure in the Windows Task Scheduler under the Task Scheduler Library. Please note it must be ‘run as administrator’ to see this info. The "Install SOLIDWORKS 20XX" event status captures the fate of your image launch. In SOLIDWORKS 2017, there are high hopes to bypass the Windows security restrictions that plague the automatic deployment today. 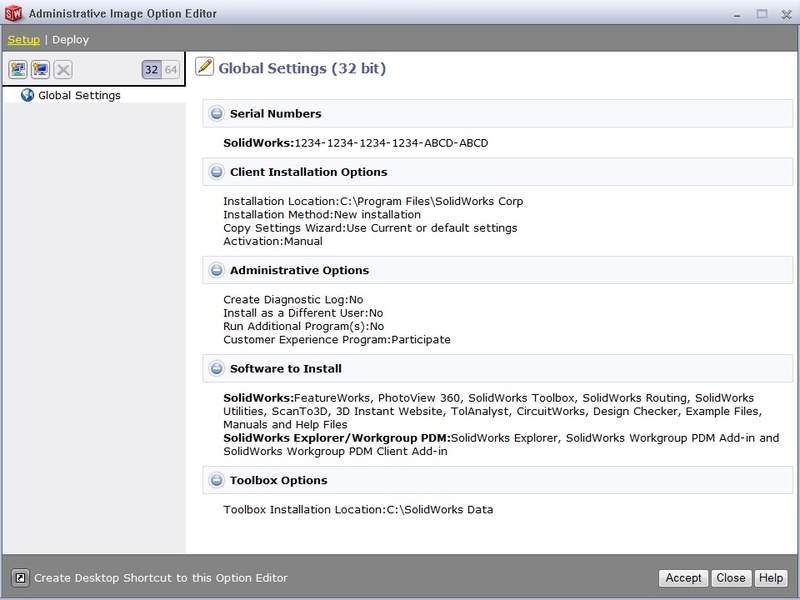 A hybrid approach using a software distribution product (like SCCM) with the SOLIDWORKS Administrative Image Option Editor is recommended but not supported. You can define your install customization in the Option Editor, and then use the other product to push out the image. This has worked well for folks. I hope that helps you (or at least saves you some frustration)! Need help with your SOLIDWORKS Installation? Our Tech Support team is standing by to assist you!